1. Can you tell me...? 2. Could you tell me...? 5. (Got / Have you) any idea...? 6. Could anyone tell me...? 7. (Do / Would) you happen to know...? 8. I don't suppose you (would) know...? 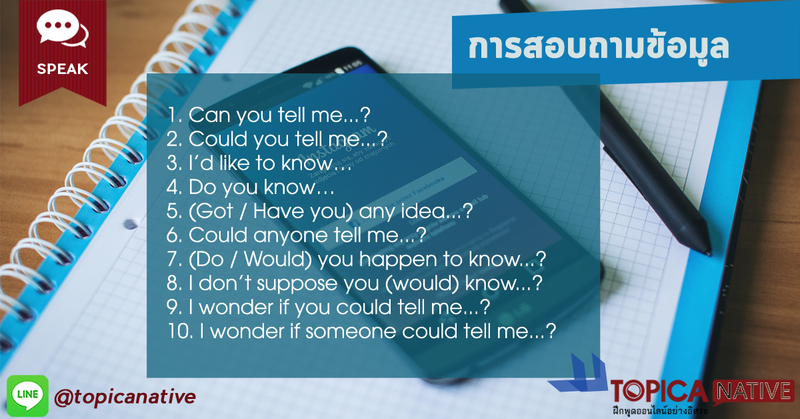 ฉันไม่คิดว่าคุณ ( จะ ) รู้ว่า…? 9. I wonder if you could tell me...? 10. I wonder if someone could tell me...?